I'm not really all that picky about the bunny, but this is my favorite slipper style. I need to be able to just slip them on while holding baby Jack and 12 other things with my hands. 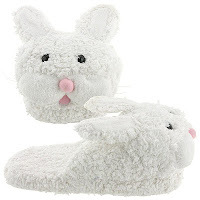 If you knew me a few years ago, I usually carried slippers with me to other peoples' houses - I just really hate having cold feet! !